Aiming to enhance your business efficiency, Easy PDF to Image is packed with various convenient features, allowing you to convert varied PDF files to image format with minimum consumption of time. Aiming to enhance your business efficiency, Easy PDF to Image is packed with various convenient features, allowing you to convert varied PDF files to image format with minimum consumption of time. With Easy PDF to Image, you can easily convert PDF to PNG, TIFF, JPEG, even doc file, and you will find it can't be easier to convert PDF to image. Easy PDF to Image is packed with various flexible features, allowing user to perform the task of converting as per requirement. 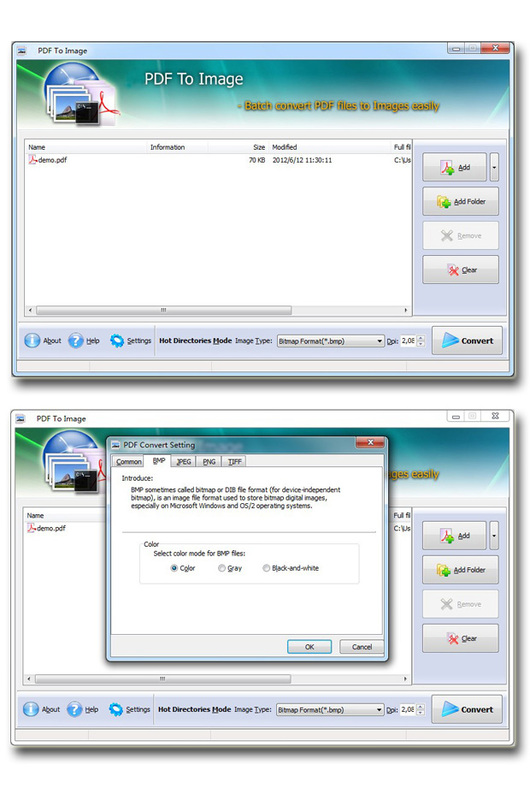 There are 3 different mode selectable to run converting, and multiple output formats are supported, you can deal with your PDF files actually as your specific requirement. Free Flipping Book Maker is swift and powerful software which can publish flip page book from plain text file for free. It retains the bookmark, links and page layout of original txt file in the conversion. Flipping Book Publisher for Image is an easy to use gorgeous creator of stunning online photo albums from your photo collections. It takes you only few minutes to publish photo book with realistic flash flipping. Easy PDF Text Replace enables you to replace the unwanted text in the PDF file with new text, or just delete the text unwanted. Flipping Book Publisher for ePub converts epub, XML-based distribution format for e-books to flash flip book with page flip effect. It's a simple to use epub software since no flash skill is required and no third software need to be installed. Easy PDF Watermark is an advanced but easy-to-use desktop program, it help to add visual image or text watermarks (such as DRAFT, CONFIDENTIAL, even your company's name and logo) to either a single Acrobat PDF file or a batch of files. You can free download this August theme to decorate you flipping book. We provide series of novel templates for you to choose and download. Our ever-updating templates help you always get an amazing flipping effect. It is a good way to share the information with PDF all over the world. However, convert PDF file to Adobe flash with FlipBookMaker PDF to Flash Converter brings a more convenient way to share or exchange and read PDF file with others. PDF Joiner and Splitter is a request that provide user to perform several operations on PDF file such as split, join, combine, add, delete, break etc. You can extract as well as remove un-required PDF pages. Tool supports password protected PDF. This site does not contain serial number, crack, keygen Easy PDF to Image serial number : serial number is the simplest type of crack. A serial number(cdkey,product key,etc) is register the program as you may already know. a crack or keygen may contain harmful software. If you cannot find the exact version you want, just give it a try. for more information read .nfo/.txt/.diz file include in zipped file.